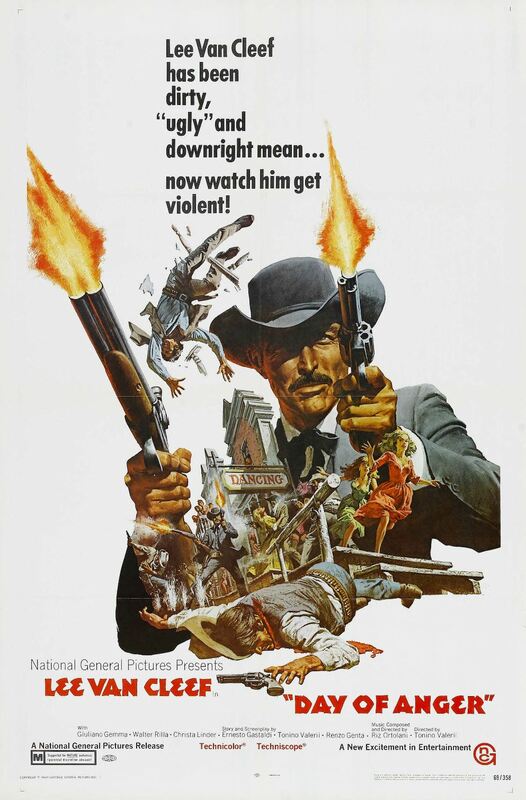 Pax and I talk about the 1967 spaghetti western starring our favorite, Lee Van Cleef! And in "Whatchoo Been Westernin'?" we briefly discuss the graphic novel Abbadon, the Pinkertons TV series, and the 2012 Wesley Snipes film, GallowWalkers. Once you're done with that episode, stay tuned for a special Hitchin' Post where we recast Day of Anger with modern actors. If you like The Orville, there are a couple of podcast episodes you should listen to. Early this week, the latest Planetary Union Network came out in which Joe and I talked with The Orville's costume designer Joseph A Porro. Like everyone from the show whom we've talked to, Joseph was super nice. We talked about the special fabric used on the crew's uniforms, the inspiration for the departmental colors, and the challenges of designing clothing for an alternate version of 21st Century Earth. 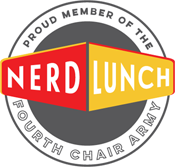 Then yesterday, Nerd Lunch released an Extra Helping where Jeeg, CT, and I talk about the first season as a whole: why we started watching, why we kept at it, our favorite characters and episodes, and what we'd like to see in Season 2. And finally, Erik, Dave, David and I wrapped up the Mystery Movie Night year talking about sewers, Sweetums, sweaters, and the secret connection between them. That's a lot to listen to, but you have a long weekend, so enjoy! And Happy New Year! 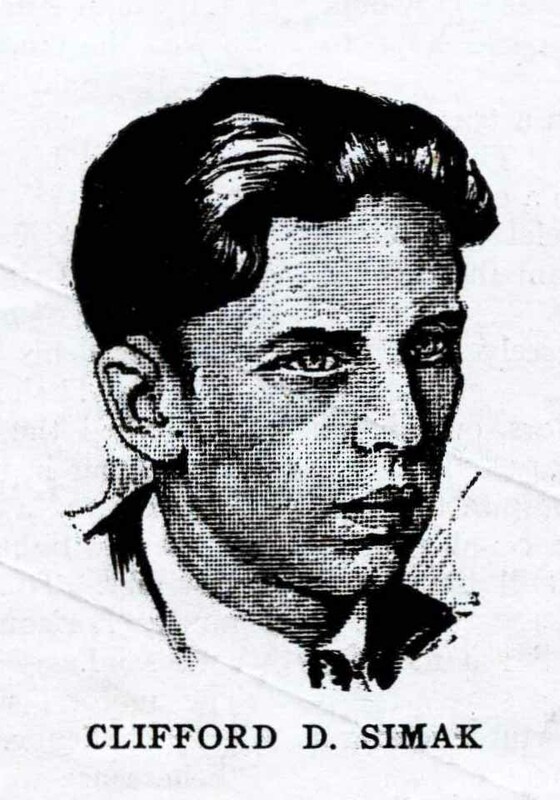 Clifford D Simak (1904-1988) had a writing career that ran for fifty-five years. He was one of the early SF writers who could adapt to changes brought about by John W Campbell at Astounding. The stories listed here are his early works before this transformation. Usually I lament the Campbell revolution (or at least oppose the snobbery that came of it), but in the case of Simak, I would agree that these early stories are not even close to what he would achieve later. These 1931-32 stories include four stories for Hugo Gernsback at Wonder and one for Harry Bates at the Clayton Astounding. After 1932, Cliff took a three year break, writing one tale for the short-lived semi-prozine Marvel Tales before taking another three year break. The new Simak emerges with this last tale that tackles religion head-on. When he returned in 1938, it was with "Rule 18" for John W Campbell. The old Simak was gone forever. 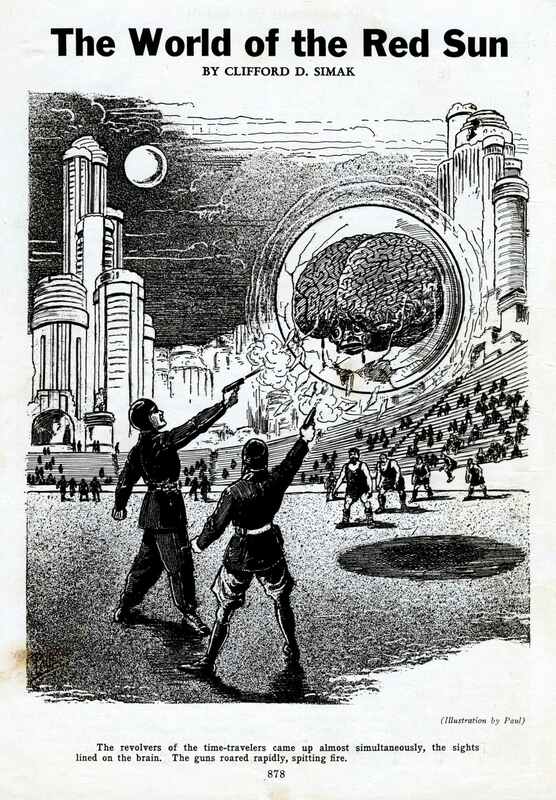 "The World of the Red Sun" (Wonder Stories, December 1931) was Simak's debut as one of Hugo Gernsback's growing stable of new writers. The story takes two time travelers, Harl Swanson and Bill Kressman, to Denver millions of years in the future. There they find the human race reduced to savages by a weird being calling himself Golan-Kirt. This entity from Out of the Cosmos can kill men with his mind. In an Edgar Rice Burroughs-style arena scene, the travelers take on Golan-Kirt armed only with their .45s and the knowledge that he kills with illusions. (The creature claims to be from space, but the travelers figure it is actually a mutated scientist from a scenario like that in Edmond Hamilton's "The Man Who Evolved" [Wonder Stories, April 1931]). The humans win the mental battle by ridiculing the monster; laughing at him (shades of Star Trek!). What might have been a happy Burroughsian ending turns sour though when the men try to return to their own time. Isaac Asimov noted the story in his anthology Before the Golden Age, because Simak wrote in a plain workman-like style, differing from many of the others in Gernsback's magazines, and because of the downer ending: one still mimicked in the final moments of films like The Planet of the Apes decades later. "The Voice in the Void" (Wonder Stories Quarterly, Spring 1932) has Simak poking at religion for the first time, a theme he would tackle again and again in stories like "The Creator" (mentioned below) and in novels like Project Pope (1981). Two adventurers, Ashby and Smith, take on the Holy of Martian Holies when they steal the bones of Kell-Rabin. The Martians hunt the fugitives down and even place Smith's brain in a tube, a form of immortality. Ashby escapes with the tube as well as another - containing a Martian priest - and hides in the desert. There the three (one man and two tubes) discover an ancient pyramid from a religion that predated Kell-Rabin. 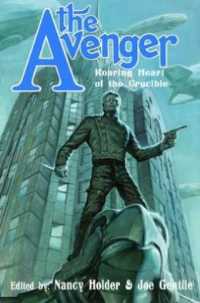 Inside, Ashby finds an immense treasure and the means to exact his revenge: a vengeance that gives the story its title. Simak once again ends on a sour, ironic note, but does reveal the mystery that drives the entire story: What is in the coffin of Kell-Rabin? Stories using amputated brains began as early as MH Hasta's "The Talking Brain" in Amazing Stories, August 1926, but really take off after Edmond Hamilton's "The Comet Doom" (Amazing Stories, January 1928), inspiring HP Lovecraft's "The Whisperer in Darkness" (Weird Tales, August 1931), Hawk Carse's disembodied scientists in "The Affair of the Brains" (Astounding, March 1932) by Anthony Gilmore, Eando Binder's oft-reprinted "Enslaved Brains" (Wonder Stories, July-September 1934), and the classic novel Donovan's Brain (1942) by Curt Siodmak. 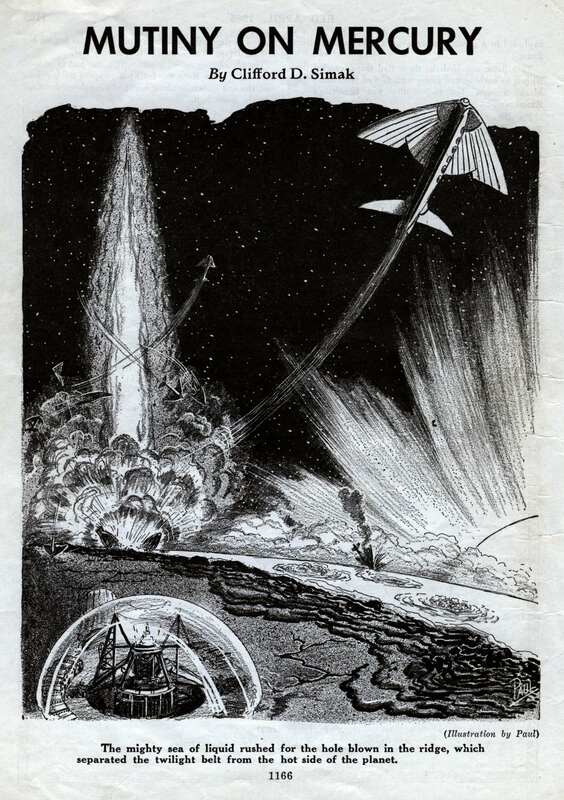 "Mutiny on Mercury" (Wonder Stories, March 1932) is the high-point of the early Simak. In this story, he describes a Martian rebellion from the point of view of an Earthman in a domed space station on Mercury. Besides writing a good action adventure, Simak describes the dangerous existence on the first planet along the strip between the hot and dark side: the only place living things can survive. When the Martians and their Moon Men stooges destroy the airlock on one of the domed stations, the author gets to tell what losing an atmosphere from a spaceport would be like. Simak does a great job of creating a Solar System of varied humanoids, like Leigh Brackett would do later in her Interplanetary mythos. Simak finishes the story with a space-flyer battle worthy of Edmond Hamilton. The only criticism I have of the story is its out-of-date (even for 1932) Imperialism. The Martians and other aliens are presented as inferior and conniving, but it is hard to identify with a race of men who would subjugate such people. 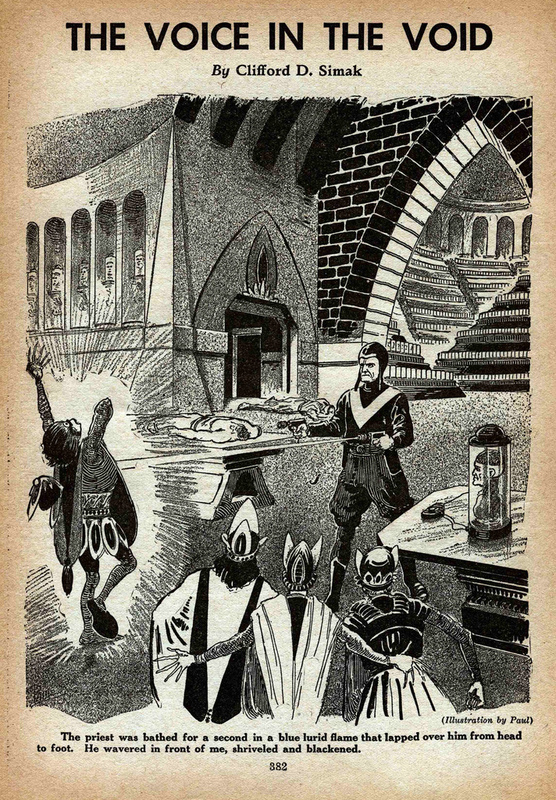 "Hellhounds of the Cosmos" (Astounding, June 1932) almost feels like a regression after "Mutiny on Mercury." Some of this may be the fact that Simak was writing for Harry Bates instead of Hugo Gernsback. The tale begins like so many others at the Clayton Astounding: a world under attack by alien invaders. Here Simak deviates from the usual story of a brave young scientist who saves the world (and a pretty girl) with an invention. 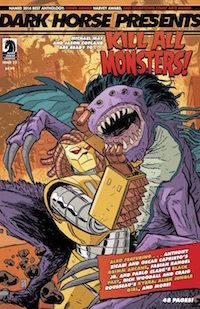 His hero is a newspaperman, Henry Woods, who visits a scientist, Dr. Silas White, and discovers that the black terrors that have been attacking the world are creatures from the fourth dimension. Simak gives a rather convoluted explanation for how these creatures are actually less evolved than the beings in our three dimensional world. All goobley-gook aside, Dr White invents a machine that will translate humans into the fourth dimension to strike back at the invaders. Ninety-nine men go into the weird light, including our newspaper reporter, to find that in the other dimension they form a singular creature, named Mal Shaff. This weird brute has a knock-down fight with another monster named Ouglat, amidst a world of steel cliffs and red skies. Mal Shaff begins to lose because Ouglat is growing bigger. The invaders have been recalled from Earth and grow Ouglat to mammoth size. Dr. White saves Mal Shaff by sending in the Marines, allowing Mal Shaff to destroy his opponent. Once victorious, other fourth dimensional creatures invite Mal Shaff to stay and none of the men who went across ever come back. Simak, master of the downer ending, strikes again! How un-Astounding! What I found most interesting about this story was comparing it to the horror fiction of Frank Belknap Long. His province of other-dimensional monsters can be seen in stories like "The Space Eaters" (Weird Tales, July 1928), "The Horror From the Hills" (Weird Tales, January-March1931), and especially "The Hounds of Tindalos" (Weird Tales, March 1929). Long's Cthulhu Mythos horror fiction centers on weird other-dimensions, attempting to create a Lovecraftian frisson of terror. Simak (who was probably familiar with Long's work) tries for something more SF and less horror, but it is certainly his closest to a horror tale in these early stories. "Asteroid of Gold" (Wonder Stories, November 1932) has the Drake brothers mining a gold-rich asteroid when space pirates capture them. The leader of the pirates, the notorious Max Robinson, devises a cruel torture for the two. He places their ship on the twin of the asteroid, another rock revolving just out of reach, and leaves the two men only three air bottles. Max glories in the idea of the two close brothers fighting for that last canister of air. The Drakes settle down to die with dignity, but chance intervenes. A meteor hits the Twin, causing it to fly towards the asteroid. 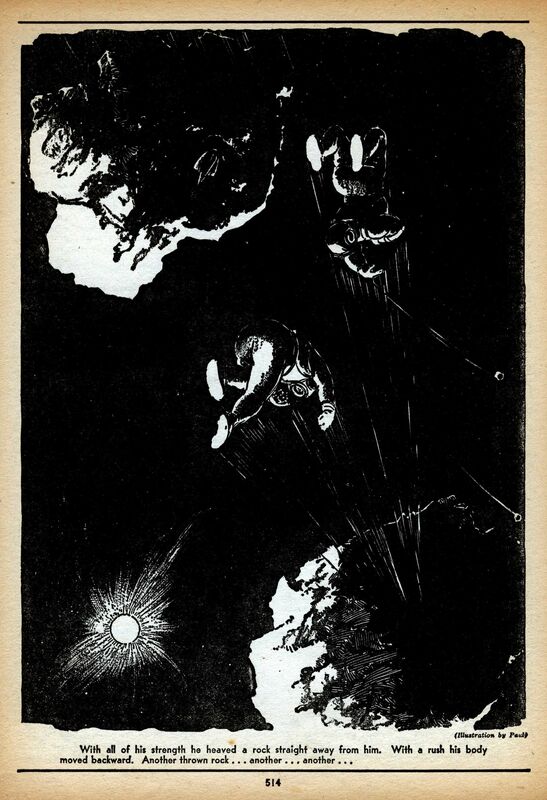 A desperate race begins, with the men leaping from rock to rock (seen in the illo) in an attempt to avoid being crushed. The plot almost feels like a Campbell puzzle story (like Asimov's "Marooned Off Vesta"), where the two men would have used the third tank to propel them through space to the Twin. This doesn't happen, but some Age of Wonder action and excitement does instead. If Simak had written this ten years later, it would have been a much different ending. CDS was not always serene in his attitude to such questions [religious matters]. "The Creator" is very different. In its time it was notorious. CDS wrote it in 1933 or '34 after he had more or less decided that his dalliance with sf was over. The editor WL Crawford persuaded him to write one more... And, though it bears the stamp of its era, and though it is a product of a young writer, it stands as a stimulus to thought even today. The plot of "The Creator" has two scientists, Scott Marston and Peter Sands, discover time- and space-travel through a combination of machinery, mediation, and dreams. One vision in particular is of a vast laboratory. When they finally transfer their physical bodies there, they meet the Creator, a being of glowing light. The Creator introduces them to three other time travelers from other worlds. He also shows them our universe, a mushy grey thing that the Creator made, then injected with life. When the men discover that the Creator is working on a method of destroying all matter and eradicate our universe completely, they join up with the other aliens and defy their master. Using a machine constructed by one of the other travelers (an alien that looks something like a stick bug), the time travelers flee with the universe in a bubble of purple force field. The Creator tries to destroy them, but is himself destroyed. The creatures from the universe have killed their god. When Marston and Sands return to Earth, something goes wrong and they end up lost in time. Looking at the story, we can see that Simak has rewritten "The World of the Red Sun." He spends more time in explaining the time machine and its creation, but ultimately it is the same tale. Instead of Golan-Kirt, we have the Creator; instead of two men defeating him, we have five time travelers of different races. Again, there's the suggestion that the Creator is himself a lab experiment from some other, higher being, and finally, there's the unhappy ending with the humans lost in time. If Simak was leaving SF for good, perhaps he felt that repeating himself, enlarging on and improving his first effort, was not a bad way to finish off where he had begun. The early parts of the story are quite Lovecraftian, similar in idea to HPL's "Beyond the Walls of Sleep," but like with "Hellhounds of the Cosmos," Simak doesn't use the device to produce creepy thrills. Instead, it's an SF means to tell his story. He would later in his career give a nod to Lovecraft in “The Call From Beyond” and in the episodic fantasy novel Where the Evil Dwells (1982), when the adventurers enter a temple inhabited by other dimensional monsters right out of Arkham. Perhaps in 1934, he had contemplated joining the Weirdies in Mythos-building and remembered that time fondly fifty years later. All the stories mentioned above are worthy of reading, but when I look at them critically I see that most could be changed to ordinary adventure stories quite easily. "The Voice in the Void" could be a desert adventure with Arabs, "Mutiny on Mercury": an airplane adventure; "Asteroid of Gold": a pirate yarn. 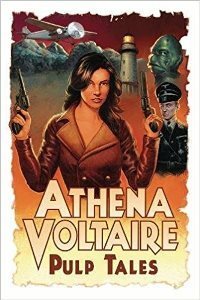 Despite these connections to other forms of pulp writing, Simak does play with some big SF ideas. His time travel story "The World of the Red Sun" throws off big ideas a little too quickly, never really developing some of them. Here was a young writer excited about all the possible stories to tell. But by 1935, Simak was dissatisfied with the field. As Lyall wrote, he "more or less decided that his dalliance with sf was over" and he was moving on. It took John W Campbell and Astounding Science Fiction to change Cliff's mind. With SF going in a new direction, Simak joined the ranks of Asimov, Heinlein, de Camp, and others in pushing SF forward. A necessary evolution, I suppose, but I have a fondness for these early stories. They spark with the possibilities of what is to come. Clifford D Simak was one of those early torchbearers and we can only thank him for all the great stories he wrote. From just about the very beginning of comic books, publishers have realized that with the extra leisure and more generous spending habits of December, it’s a great time to sell more comics. Thus the Christmas Special. From Bugs Bunny to Superman, the Christmas comic became a seasonal surety on wire store racks. 1950 was the year Gene Autry tried for Christmas gold a second time. His first hit had been “Rudolph the Red-Nosed Reindeer,” which had been Number 1 the year previous. His rendition of Jack Rollins and Steve Nelson’s song “Frosty the Snowman” proved almost as impressive (getting to Number 7), adding yet another entry to the pantheon of non-religious Christmas characters. The song would have to wait nineteen years to get a cartoon based on it, but in the meantime, the comic specials filled that void. Dell had the popular anthology comic, Four Color, which alternated between familiar newspaper comic characters, Disney and Warner Brothers, to movie and TV adaptations. The year after Autry’s hit, readers saw the first Frosty the Snowman comic with Four Color #359 (November 1951). Written and drawn by Jon Stanley and Dan Gormley, it set the pattern for the next ten years. Gormley would draw seven of the eleven issues, each showing up in November or December. Many of the stories are suggested by the original song. “Before I melt away” inspires several stories where Frosty needs to keep himself from melting, such as “The Heat Wave” (December 1961). “There must have been some magic in that old silk hat they found” gives us several stories about the hat, whether stolen by evil snowmen or lost in a mix-up after being cleaned. Later, when the cartoons were done in the 1960s, they too latched onto these ideas. The first full-length story, “The Evil Snowman,” features a villainous snowman with a black Russian beard. The story would get a second version (called “The Snowman Contest”) in the final issue where the evil snowman wears a checked vest instead. (After eleven years of stories, even Gormley had run dry.) This first issue also introduces some of Frosty’s sidekicks: a rabbit named Skeeter, Santa Claus (with his elves and reindeer), Jack Frost, the Straw Man, and a gang of kids who come to the rescue whenever Frosty needs them. Most of the Frosty plots follow similar themes. There are a good number of stories in which Frosty loses his hat like, “Frosty the Snowman and the Old Top Hat” (November 1952) and “Magic Hat” (December 1958). He doesn’t turn into an immobile snowman, but he can’t walk around (or skip and dance, as he often points out) either, and it is up to kids or animals or mere chance to bring his hat back. Other stories focus on Frosty as helper or hero, usually for a small child or animals, like the ducks and other forest creatures in “Saving Frozen Ducks” (November 1952), “Frosty the Snowman Makes the Forest Safe”(November 1953), and “Frosty the Snowman and Peter Polar Bear” (November 1954). In these tales, Frosty may go on a long journey, giving the story a grander scope than the neighborhood tales. Sometimes he is helping Santa Claus, like when the elves all come down with the flu or the toys are missing. Frosty encounters a number of witches in these stories, as they require a villain, like the one who has taken all the hobby horses in “Frosty the Snowman and the Crystal Castle” (November 1953). Wolves and foxes also show up as bad guys. Frosty also acts as teacher sometimes to boys who have lost their way. “Bad Bobbie” (November 1953) has Bobbie tricking Frosty into shoveling the walk for him, but when Bobbie tries to get Frosty onto skis, the tables are turned. Frosty is an expert skier and causes a pile of snow to recover Bobby’s walkway. These bad boys usually see the error of their ways and become good with Frosty’s help. And lastly, my favorite of the Frosty stories are mysteries, where Frosty acts as detective. The November 1954 issue had “Down on the Farm” where a “ghost” is playing practical jokes on the farm animals. Frosty, of course, uses his little white cells and figures out who is the culprit. “The Missing Page” (December 1960-February 1961) has Frosty help a girl find part of a missing book. In 1964, Rankin-Bass' animated Rudolph the Red-Nosed Reindeer would premiere. 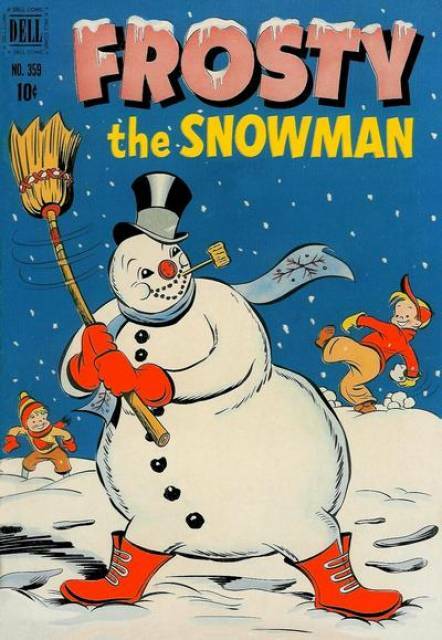 A perennial favorite, it featured a snowman named Sam, not Frosty (and modeled on the actor who played him, Burl Ives). 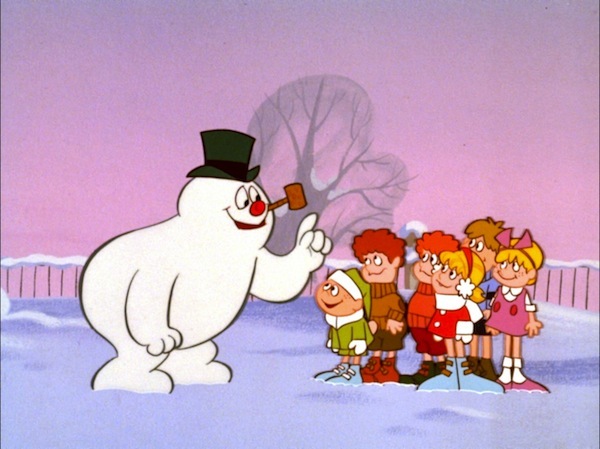 In 1969, Rankin-Bass acquired the Frosty property and put out an animated cartoon of him that has also become a seasonal fixture, with Jackie Vernon as the loveable snowman. R-B did a crossover cartoon in 1979 called Rudolph the Reindeer and the Island of Misfit Toys. 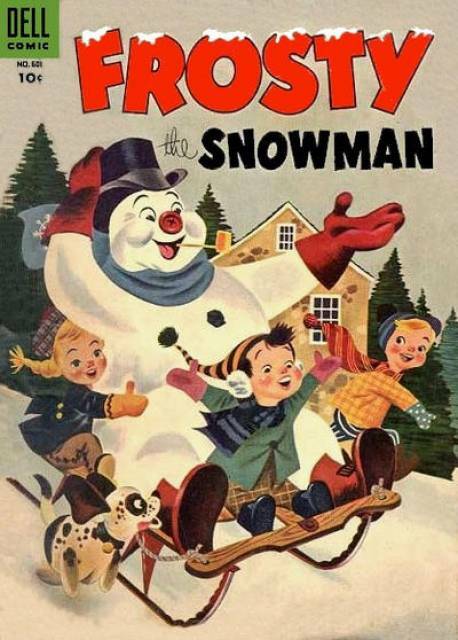 All of these animated shows remind me of material in the Dell comics, especially the idea of Frosty's becoming associated with Santa and the North Pole, though it is hard to say if they had any influence as many of the ideas can be found in the original song. In the TNT Christmas Carol, Scrooge went to bed not at all sure that he'd really seen Marley. The ghost's words had made Scrooge pause and think, but as far as he knew, he was going to be able to fall asleep and wake up the next morning completely the same. He's snoring as this scene opens, but he's awakened by a distant chiming. "Quarter past," he notes, and grabs the newspaper he'd taken to bed with him. The chiming continues though and Scrooge gets confused. "Half past?" And on it goes through "quarter to it" and "the hour itself." By the end though, he's not trying to figure out why time has sped up; he's relieved. "Nothing's happened," he says confidently. He knew it was all in his head. Or rather, in his stomach. But the "hour itself" chime was just the lead up to the actual tolling of the hour. When that sounds, a bright light shines in the room and a black-gloved hand pulls aside Scrooge's bed curtains. 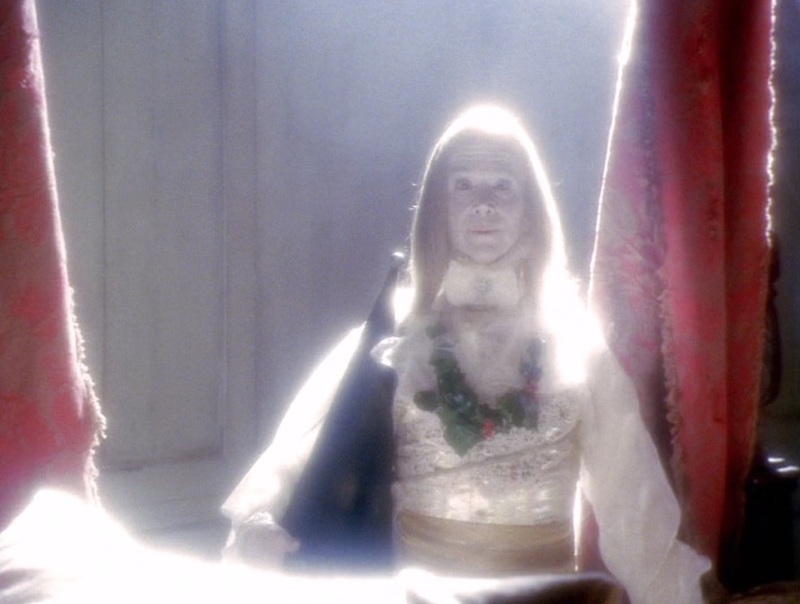 It's Joel Grey looking very bright and Christmasy in a white poofy shirt, silver vest, and gold cumberbund. He doesn't hold the holly branch, but - like a couple of other versions - wears a garland of holly around his neck to keep his hands free. He carries the cap under his arm and I almost want to ask him to put it on myself, because an extremely bright light is shining on him. So much so that it washes out the rest of the picture. This is intentional though and the film will correct it soon. Scrooge has to shield his eyes with his hand just to look in the spirit's direction. 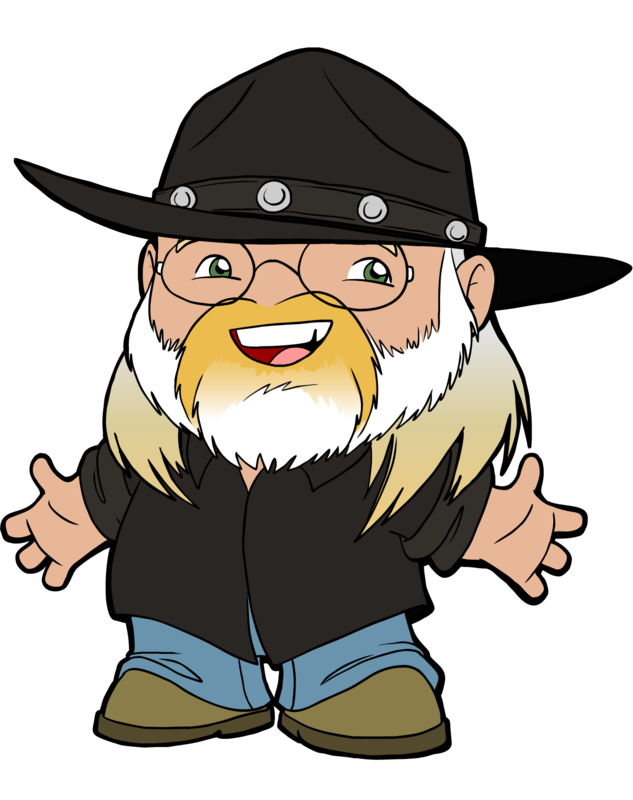 As they get the introductions out of the way ("your past"), Grey plays his role impishly with a twinkle in his eye and a mischievous smile on his lips. He stands very still as he does it, letting his face do all the work. It's a lovely performance and I like his Ghost immediately. Scrooge asks the Spirit to put on its cap and be covered. The conversation goes as Dickens wrote it, but when Scrooge respectfully says that he has "no intention of offending you, sir," the Spirit's glow dims to a manageable level. He does have Scrooge's welfare at heart. When he says so, Scrooge gets cranky and complains that a peaceful night of unbroken rest would have been more conducive to that end. I still get the feeling that Scrooge doesn't quite believe what's going on. But whether it's real or not, he resents its intruding on his sleep. However, when the Spirit changes his phrasing to "your reclamation, then," that makes Scrooge thoughtful. Marley said that he believed Scrooge needed saving and now this Spirit has repeated it. It's starting to sink in. The Spirit holds out his hand to Scrooge and says very gently, "Come with me." Scrooge makes some awesome excuses. "Some other time, perhaps. I'm not dressed. I have a weak chest. Monstrous head cold." He's trying to reassert some control over the situation, but the Spirit oh so mildly insists. His hand still outstretched, he nods and smiles. "Rise. And walk with me." I love Grey in this. It's probably my favorite Christmas Past. And of course Patrick Stewart is amazing as well. He gets up and holds out his hand, but he's shaking his head the whole time and there's fear in his eyes. If he touches the Spirit, this is going to become real. And that terrifies him. As the Spirit leads him toward the window, he becomes even more frightened. He says that it's because he's mortal and liable to fall, but I don't think it's about the height. It's about whatever he's about to experience. And it suddenly hits me that Scrooge's mortality and ability to fall is also a metaphor for his spiritual state. He's petrified at being confronted with his own fallibility. It took Stewart's performance to reveal this. Genius. The Spirit reassures Scrooge that "all I have to do is touch you... there." And he gracefully puts his hand on Scrooge's chest. He doesn't have to say, "And you shall be upheld." It's all in the performances. Scrooge's fear. The Spirit's encouragement. It honestly puts a little lump in my throat. And as if to not agonize Scrooge further, the Spirit doesn't fly out the window with him. Instead, the room dissolves around them and becomes a snowy forest. The Muppets cut from Scrooge's going to bed to back outside where Gonzo and Rizzo are trying to get inside the house to continue narrating. It's some fun shenanigans, but nothing important to the story. Back inside, Scrooge is asleep and still holding his poker. He's left a candle burning and it's lighting up the room pretty well; even shining through Scrooge's thin bed curtains. A clock shows that it's five minutes to one, so the film uses the time to visit Gonzo and Rizzo again as they're climbing a rope to get to Scrooge's upstairs window. Gonzo is back to narrating, talking about how Scrooge is in a dreamless sleep. Inside once more, the clock finally chimes one and causes Scrooge to open an eye. His candle goes out and Gonzo, now on top of a tree branch right outside Scrooge's window, yells a repeat of the Marleys' warning, "Expect the first ghost when the bell tolls one!" And on cue, Scrooge's window fills with blinding light. Scrooge is startled into getting up and - poker in hand - opens his bed curtains. The light gathers itself into a single point, finally taking the form of a small, floating child with gauzy robes that swim around her. There's no cap or holly and the only reference to fire is her flaming red hair. Scrooge puts down the poker and comments on her apparent youth. She explains that she can remember nearly 1900 years, so she's the Ghost of All Christmas' Past, then; not just Scrooge's. Scrooge is polite. He's probably a little freaked out, but she doesn't appear to be a threat. And when she says that she's there for his welfare, he's bold enough to suggest a night's unbroken rest might aid him better. She changes her mission to his "salvation, then." If the story is about Scrooge's avoiding Hell, then words like "reclamation," "redemption," and "salvation" are relatively interchangeable, but I don't think that's the best interpretation. When we get to the Ghost of Christmas Yet to Come, the focus will be on Scrooge's impact on this world; not his fate in the next. So in that context, "salvation" has to refer to Scrooge's being saved from his own misery. It basically means the same thing as "reclamation," where he's being reclaimed from Misery for the side of Joy. In both cases, it's a rescue mission and I like both words better than the Albert Finney version's "redemption." "Reclamation" is still the best word though, because "salvation" does carry a specific religious connotation that the story isn't really focusing on. When she tells Scrooge to "take heed," there's no threat in it. She's too tiny and sweet. She just wants him to be careful and pay attention. She's clearly there for his own good, if only he'll let her help him. When she tells him, "Come," it feels like a request. The windows open by themselves though (revealing Gonzo and Rizzo on the branch outside) and that worries Scrooge. He expresses his concern about going out that way. "A touch of my hand," she responds, "and you shall fly." In so many of the last few versions we've looked at, the hand on the heart is ignored and the Spirit's touch is all about magically getting Scrooge where he needs to go. That's disappointing. Scrooge does touch her tiny hand though and off they fly through the window. Gonzo chuckles gleefully and swings his grappling hook. Ho! Ho! Ho! The latest Dragonfly Ripple is all about the Most Wonderful Time of the Year! 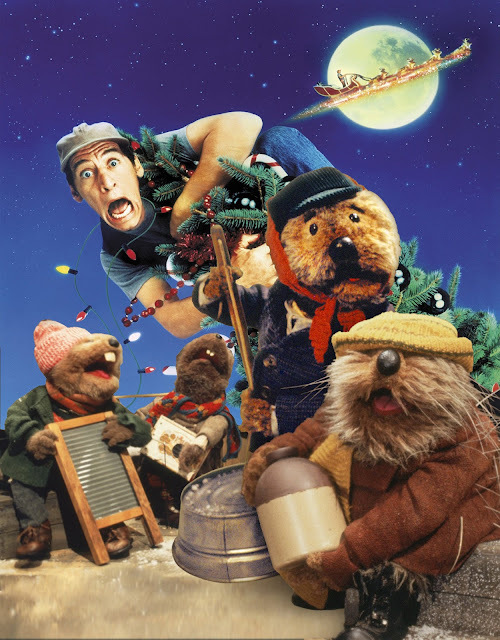 Carlin and I start the show talking about Christmas movies and TV specials that we grew up with. Which have stood the test of time? Which are still annual must-watches? Then, when Annaliese and David join in, we discuss with them a couple of specific Christmas productions from Jim Henson and Ernest P Worrell. And on a special Jetpack Tiger, Dashiell flies solo to talk about the experience of learning The Truth about Santa. There are SPOILERS about the Easter Bunny and Tooth Fairy as well, so be careful about listening around young ears. Finally, we all talk about which nerdy Christmas ornaments we wish existed to hang on our trees. I hope you'll listen and enjoy, but even more, I hope you're having a happy holiday season. After Scrooge goes to bed, director Clive Donner's TV movie cuts to a church steeple where the bell is tolling one. And back in Scrooge's bedroom, his little pocket watch is also chiming with a distinctive, merry little tune that becomes important later in the story. It's the bong of the church bell that seems to wake Scrooge up though. He sits up in bed, notices the time, and tries to remember, "What was it Marley said?" It's elusive though and nothing is happening in the room, so Scrooge concludes that Marley's visit and warning was just a dream. Of course, that's the Spirit's cue. A wind blows through the room and into the curtained bed and then Scrooge notices a twinkling light. Maybe. It's really just a directorial flourish, because the twinking is inside the bed curtains and it turns into a bright reflection on the Spirit's large snuffer cap. The Spirit's not appearing on the bed though; this is just Donner's preferred way of communicating that spirits are transporting themselves. With Past, Donner will focus tightly on the cap as a way of transitioning from one scene to another. With Present, he'll use the Spirit's torch. So in this first instance, the large cap simply represents the first spirit's arrival. Scrooge's bed curtains part and he sees the Spirit standing in the middle of the room. Like in the Albert Finney version, she's an older woman (well, middle-aged, anyway), but this one is trying to be faithful to Dickens. Her hair is long and - if not white, then at least very light, almost platinum blonde. The actor Angela Pleasence has an impish, mischievous look that gives a youthful quality to the character and she's dressed in archaic-looking robes and carrying the holly branch. She doesn't quite hold her cap; it just hovers near her. Scrooge's attitude toward her is polite, but he's not at all afraid. It could be that he still thinks this is humbug, but he's at least willing to play along and see what happens. For her part, the Ghost is businesslike. That's probably the right approach to take with this Scrooge. She keeps it professional - at least at first - and he respects that. Their conversation goes pretty much how Dickens wrote it, but with some nice changes. When he asks her to put on the cap, for instance, he expresses it in terms of "perhaps you'd do me the favor..." Her response is that she brings the light of truth. "Would you use this cap to put it out?" Scrooge is immediately and sincerely apologetic, but he's not nervous or frightened about it. He asks forgiveness from her like he would from a business partner or a peer. The "light of truth" angle is interesting. I've written a lot this year about how this Ghost represents Scrooge's memories, but it's really more than that. She's going to show him things not as he remembers them, but as they really happened. The story doesn't make a big deal out of the difference between memory and reality, but she makes it clear up front that this is about objective reality. Her mission isn't to remind Scrooge of particular feelings; it's to show him factual events that cast light on the man he's become. He continues to try to negotiate with her when they discuss his welfare. "I can think of no greater welfare than a night of uninterrupted sleep." But she shuts down the conversation by subtly reminding him that she has the power in this relationship. "Be careful, Ebenezer Scrooge. I speak of your reclamation." He gives up. Even if he doesn't believe that she's real, he understands that this is something that he's going to have to go through with. "Well, if it's reclamation, then... let's get on with it." She finally smiles and holds out her hand to him. "Come." As he gets out of bed and takes her hand, fog begins to engulf them. There's no window or fear of falling. Scrooge gets to hold onto his dignity in this one. And that means that there's no talk about touching his heart. As I've said before, this version is remarkable for making Scrooge relatable and grounded. Any change he undergoes is going to be relatable and grounded as well. As they fade from view, she gives him some insight to what he's about to experience. "We shall be invisible. And silent as the grave." The musical Scrooge made sure to show us Scrooge's setting his clock at the end of the last scene, so it was about 10:07 went he went to bed. This scene picks up straight from that one. He doesn't go to sleep, but immediately hears a clock chiming from somewhere outside. I can't tell any difference between the chimes, but Scrooge somehow realizes that time has sped up. He counts off, "Half past ten," and then, "Quarter to eleven?" That gets him sitting up and looking at his own clock, which now reads 1:00. As soon as he says the time out loud, there's a large BONG! from outside and Scrooge's curtains pull aside at the foot of his bed. An elderly, finely dressed woman stands just inside his door; clearly the first spirit, but looking nothing like Dickens' description. This certainly isn't the first representation to take liberties, but the others at least put their versions in antiquated or fairy-like clothing to make them look otherworldly. This one just looks like she's visiting from a very nice neighborhood. 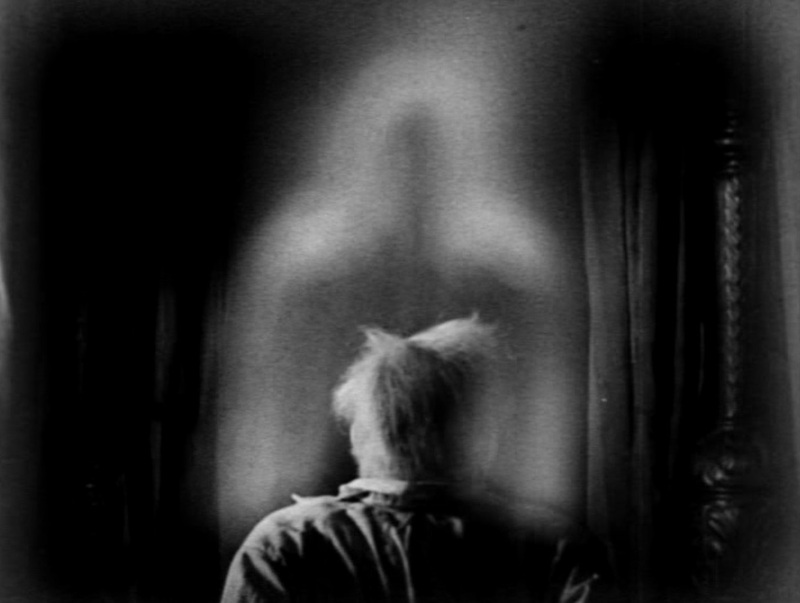 Scrooge - who went to bed not believing that he actually saw Marley's ghost - isn't afraid of this apparition. He demands to know who she is, but her reply is cagey. "I am the spirit whose coming was foretold to you." He says what I'm thinking. "You don't look like a ghost!" To which she replies, "Thank you." I'm not sure yet whether I like the contemporary look of her, but I do very much like her. She's haughty and aristocratic, which puts her in a similar category as the Alastair Sim version. She carries authority and isn't going to let Scrooge push her. He's going to try though and insists on a more precise answer to his question about who she is. She declares herself the Ghost of Christmas Past and they go through the whole "Long past? No, your past" conversation. When she says that she's there for Scrooge's welfare, he gets snotty about it. "To be awakened by a ghost at one o'clock in the morning is hardly conducive to my welfare!" I wonder if screenwriter Leslie Bricusse thought that "reclamation" was an outdated word and picked something more contemporary that sounded more or less the same. I like "reclamation" better, though, because it paints Scrooge as lost to his base, greedy impulses. He needs to be reclaimed for the side of good. The spirits are on a rescue mission. "Redemption" is similar, but it carries the additional idea of payment. Like when you redeem coupons. Nobody's paying for Scrooge in this story. They've come to reclaim him, but he's going to have to do the work of changing all by himself. There's going to be a battle of wills between the Ghost and Scrooge. She's not taking any guff, but he's not backing down either. She holds out her hand to him and commands that he rise and walk with her. He grabs her hand, but snaps, "Where are we going?" Her response is direct. "We are going to look at your childhood." And the scene immediately changes to a snowy forest. Scrooge says that he's "only slept a few minutes," but then thinks about it and adds, "or else most of the day." I'm not sure why he'd think that second part, but it's a nice nod to the confusing passage of time in Dickens' story. His window has come open during his sleep and a strong wind is blowing in, so he gets up to close it. And that's when the first Spirit appears. Like the 1938 version, this one is again a young woman, but there's a specific reason for it that we'll see in a minute. She doesn't match up with much else in Dickens' description either. This adaptation's doing its own thing. Scrooge is more curious about her than scared. He seems to have accepted that he's no longer dreaming, but he's troubled by something. "It's odd. Very odd. You resemble her so much!" He doesn't say who she reminds him of and the Spirit doesn't tell us either. We'll have to wait until later to find out. Is it Scrooge's sister? The woman he almost married? Stay tuned! When Scrooge asks her whose past she represents, she says, "Your past, among others." That's how I've always interpreted this ghost, but it's another departure from Dickens. He asks her what she wants to see him about and he's very polite about it. 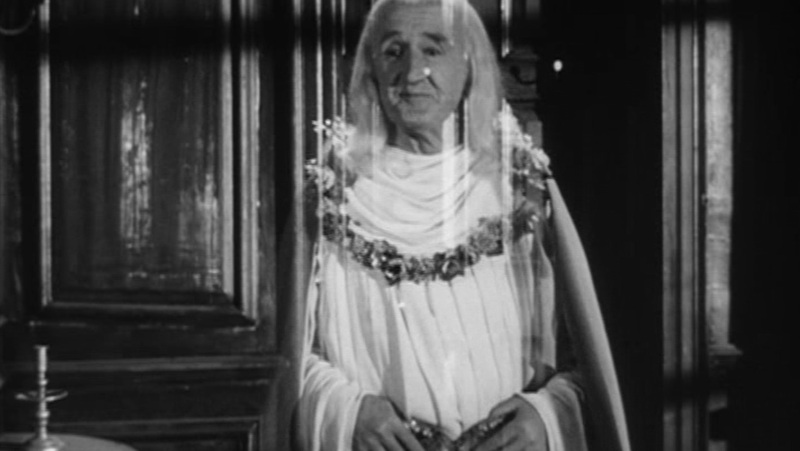 This Spirit has the same effect on Scrooge that the '38 one did on Reginald Owen, but for slightly different reasons. Owen's Spirit put him in his place by showing that she wasn't going to put up with his crap. This one calms Scrooge by appearing as someone he once loved. She responds that she's there for his welfare and he doesn't joke about it, but he does complain. He waves his hand dismissively and moves away from her, grumbling, "I've had so little sleep." It's a passive-aggressive way of trying to get rid of her and she stands her ground. "I was sent to save you from yourself." Then she adds something odd. "You've forgotten what the world is like for children." This version hasn't had Scrooge interact with any kids. Tiny Tim hasn't even appeared as a character yet. So it's a weird thing for her to say until I consider that it's really not the world's children that she's concerned about. As she just said, she's there for him. And part of the way that she'll save him is by reminding him of how he saw the world when he was young. She just had a strange way of expressing it. She goes to the window and opens it again. The wind has stopped now and Scrooge isn't bothered or even cold. She reaches out to him and says, "Come with me!" He asks, "As I am?" Undoubtedly referring to his nightgown and robe. But when she smilingly nods and says, "As you are," she might be referring to his miserable selfishness. She's very patient, this Spirit. Scrooge is still confused though. He doesn't imagine that she really wants to go out the window, so he asks, "Which way?" She tells him to take her hand and he does, but then freaks out when she leads him closer to the window. "No! Not that way! I shall fall!" "Not when you're with me," she says. She doesn't offer to uphold him by touching his heart; she just asks him to trust her. She's winning him over with kindness and the specific memory of someone he knew. Which I like quite a bit. In Dickens version, the Spirit tells him that he'll be uplifted by its touch. This one is trying to show us how memory will encourage Scrooge. He discovers that she's right about his safety. They don't even fly out the window, but the room disappears around them and is replaced by a different location. The 1951 Scrooge ended the previous scene with a terrified Scrooge jumping into bed and pulling the covers over his head. He was able to get to sleep though and this scene opens with him snoring loudly behind his closed bed curtains. He's awakened by the chiming of 1:00, so there's no fretting about the passage of time. And by the time he has his eyes open, a light is already flooding into not just the room, but his bed as well. As spooky strings trill, Scrooge stares - frozen - at his bed curtains, which are slowly pulling themselves aside. 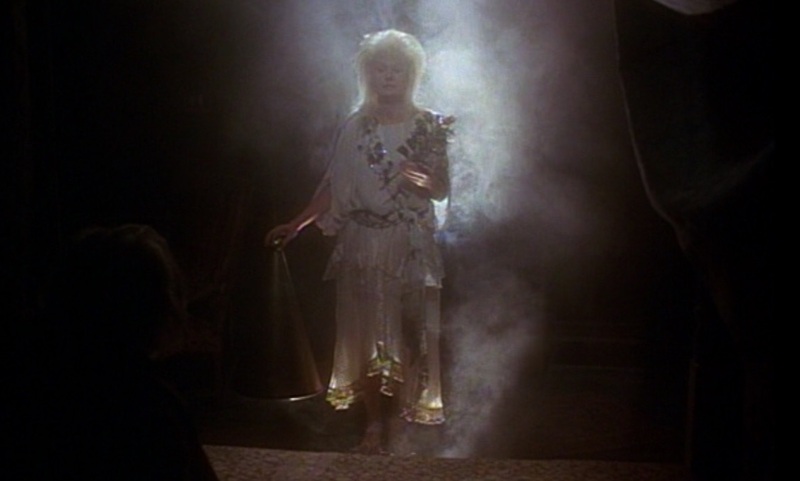 Like in the Reginald Owen version, the Ghost appears first as an aura of light before solidifying (mostly; you can still see through him) into his actual form. Director Brian Desmond-Hurst goes the opposite direction from Edwin L Marin by making this version old and male. He doesn't carry the holly or a cap, though he does wear a garland necklace, which might be where Alex Burrows and Micah Farritor got theirs from. He has a cool cape, too, giving him some additional authority. 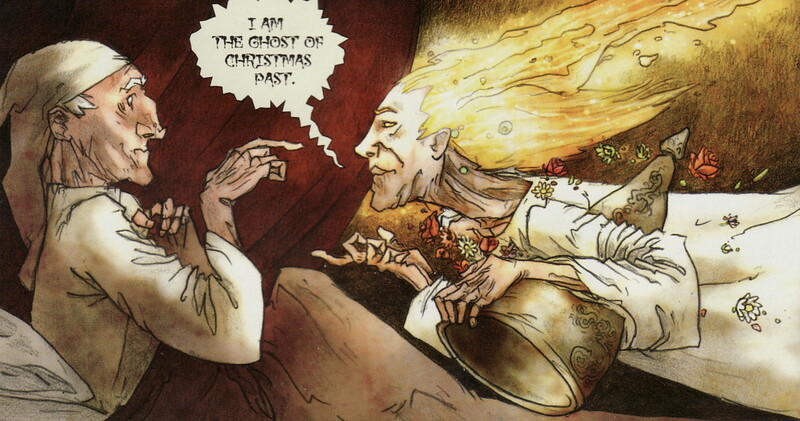 This Ghost (he prefers that title) looks much more gentle than Marley's horrifying image, so Scrooge doesn't cower. He does look extremely nervous though, smiling timidly and being very respectful with his questions. The conversation goes pretty much how Dickens wrote it and I love Sim's performance. It's not comical, but it is very funny and even sweet to see Scrooge so changed already from the cold, confident man he was earlier. When the Ghost says that he's there for Scrooge's welfare, Scrooge gives a weak little chuckle and repeats the word. He's not bold enough to even wish for going back to sleep, but he still retains enough sense of humor to see the irony of the situation. Scrooge's welfare is going to require some serious discomfort first. The Ghost allows Scrooge's misgiving and changes his purpose to "your reclamation," at which Scrooge smiles sadly, but knowingly. It's a masterful performance by Sim. The Ghost is mostly gentle, but he carries an air of authority like a schoolmaster. He's not going to be argued with and Scrooge is in no mood to fuss anyway. When the Ghost commands Scrooge to rise and walk with him, Scrooge looks like its the last thing in the world that he wants to do. But he obeys. The Ghost waits for Scrooge by the window, which opens by itself. Scrooge figures out what's next and backs away. "Through the window?" he asks. And in response to the Ghost's question of whether Scrooge is afraid, he acts like a little kid, fidgeting with his robe and turning to touch his safe bed curtain as he practically whines that he's mortal and liable to fall. This Ghost doesn't want to touch Scrooge's heart, but tells him that a touch of the Ghost's hand will uphold Scrooge in more than this. Scrooge complies, but he's still adjusting his robe and shaking his head as he does it. Rather than actually fly out the window, though, the Spirit and Scrooge simply disappear in a gust of wind and a rolling fog. The 1938 Christmas Carol jumps straight from Scrooge's hopping in bed to almost 1:00. Something wakes him up a few seconds early and he checks his pocket watch. He must decide that it's close enough to the appointed time, because he gets cocky, thinking that either Marley was wrong or that maybe he, Scrooge, dreamed the whole thing. But as soon as he says, "Humbug," the clock chimes one and the bed curtains pull themselves back. I wouldn't call Scrooge frightened at this point, but he's startled by the appearance of a glowing figure that gradually solidifies into the Ghost (as she calls herself) of Christmas Past. Director Edwin L Marin has taken some big liberties with his version, but I'm not going to complain. Ann Rutherford (from the Andy Hardy movies) plays the Ghost and she's absolutely gorgeous. In addition to being very young and very female, she doesn't carry a cap or holly. And after the initial glow effect of her appearing in Scrooge's room, she's not particularly shiny. She does wear all white though with some sparkles. And her face and hair are fair. So she does stand out in contrast to the dark room and that must be what Scrooge refers to when he complains that the light hurts his eyes. "It blinds me," he adds, being a little over-dramatic. 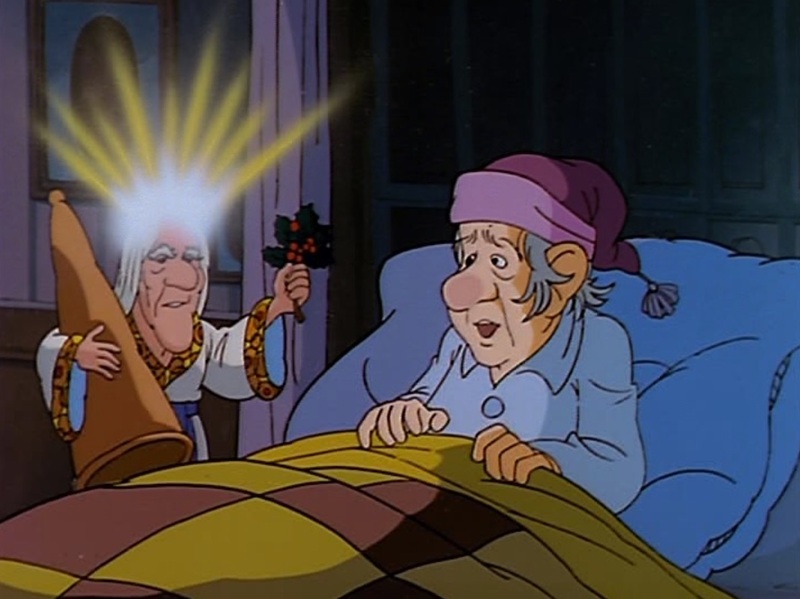 She doesn't have a snuffer cap to put on (in fact, she's already wearing a snazzy hat with a glittery star on it), so Scrooge doesn't offer a suggestion for what he wants her to do about the light. Which means that her reply is less huffy than the Spirit in Dickens' version. She simply says that she's not surprised that the light bothers him. "It's the warming light of thankfulness. The light of gratitude to others." That's a different interpretation than the one I came up with. Dickens is vague about what the light represents, but I've always thought of it as the illumination that comes from self-reflection and remembering the past. Making it specifically about appreciation feels out of nowhere, but it could work if that's a theme that the Ghost repeats throughout the scenes that she shows Scrooge. Something to keep an eye on. In a surprising display of self-awareness, Scrooge admits that he's never seen this light before. Although I believe that his comment is actually a complaint that no one has ever shown him any gratitude. Reginald Owen's Scrooge is a lonely man who seems to be interested in human connection, but doesn't know how to appropriately ask for it. He may think that he's putting signals out there - his snide comment that Cratchit might make something of himself if he worked overtime comes to mind - but his abrasiveness keeps people away. And in this moment, I'm sensing that he resents it. The Ghost turns Scrooge's comment around on him, though. She's says that of course he's never seen gratitude, because his greed has caused him to forget it. In other words, he doesn't care enough about people to show them any gratitude, so why should he expect better from them? This makes Scrooge think. "Oh," he says. And it seems to me that Scrooge is being shockingly gentle with the Ghost. He's still abrupt and cranky, but he seems willing to listen to her. And she doesn't appear willing to take any crap from him either. She reminds me of my wife, actually. I've known some notoriously miserable people who emotionally bully others and just get meaner the more that their victims back down. But Diane won't take it from them. She pushes right back and these people respect and like her for it. That's what I sense is going on between Scrooge and this ghost. He asks what her business is with him and she declares, "Your welfare," before immediately adding, "Your reclamation." There's no hint that he's making jokes to himself about unbroken rest; she's just clarifying what kind of welfare she's talking about. Perhaps so that he doesn't think that she's referring to financial benefit. She orders him to rise and walk with her and he obeys. He looks curious more than anything else. As if he's trying to figure out who this woman is and why she's affecting him the way that she does. She leads him to the window, which opens by itself, and steps up onto the sill. Scrooge looks a little worried and makes a motion with his hand. He could be asking for help up onto the sill or he could be indicating the outside and the long drop to the street. He doesn't actually need help climbing up though, so it's probably the latter. And once he's up there, he looks around silently, clearly confused about what's going to happen next. Her response to him feels a little oblivious. "We spirits have no fear." So he says what I'm thinking, "But I'm not a spirit." This is where she asks him to "bear but the touch of my hand on your heart," but instead of telling him that he'll be uplifted, she simply says, "And you shall be safe." I'm disappointed that she loses the double-meaning of Dickens' line. He does bear her touch on his chest though, and he even places his own hand over hers. And they float out the window and into the air. After Scrooge goes to bed in director Henry Edwards' Scrooge, the film cuts to outside where a lamplighter is actually snuffing out street lamps. Back inside, Scrooge sleepily tries to snuff out his own bedside candle, but he's too tired and drifts off with it still lit. It would be nice if all this snuffing of lights was foreshadowing of the Spirit and its cap, but it's not, because this version of the Spirit won't even have a cap. It could be a metaphor though, as Scrooge tries to respond to the darkening world by putting out his own light, but fails. If that's the case, then it's interesting that he fails because he's too weak. Seymour Hicks' Scrooge has been very weak so far, so it's easy to imagine why he's failed to resist despair and has basically just given up on life. But now that forces of light are rallying around him, he appears too weak to resist them either. He was frightened and childlike around Marley and he's going to act similarly with the first spirit. Which raises a concerning question about whether or not Scrooge's transformation is going to stick. Is he just a piece of grass, blown by the wind in whatever direction it decides to push him? Or is he going to be able to find something within himself during these three visits that will make him a stronger person? After Scrooge drifts off, a town crier appears in the street below to announce the hour of midnight (the time of the first ghostly visit, according to Marley, earlier). The crier's assertion that "all's well" is humorous since we know what's about to happen upstairs in Scrooge's room. Scrooge wakes up and the music gives us some spooky strings as warning that something's about to happen. The old man sits up in bed as a ghostly aura forms near his foot. It never forms into anything solid; it's just a vaguely humanoid figure of light. It's voice is masculine though when it announces that it's the Spirit of Christmas Past. Scrooge never says a word to it. He just looks sort of awestruck. The Spirit does all the talking, revealing that it's "here to show you the things that have been," and then commanding Scrooge to "look back beyond the gulf of banished years." Scrooge doesn't question or argue. He's completely passive. Thomas Edison's Christmas Carol is only hitting the highlights, so it goes straight from Marley's disappearing to the next Spirit's showing up, right there in Scrooge's parlor. There's no going to bed, much less a countdown to 1:00. In fact, Marley never even mentioned that there would be another ghost. I use the singular there, because that's what we get in this version. A title card announces that the new figure is "the Spirit of Christmas." Its first job is to help Scrooge recall "incidents of his youth and early manhood," but it's going to be responsible for ushering Scrooge through the Present and Yet to Come, too. For that reason, it's almost not worth comparing its appearance to Dickens' Spirit of Christmas Past, but it does pull the long white hair from there. In most other ways, it resembles the Spirit of Christmas Present. In addition to saving money on actors, Edison also saved money on sets by having all of Scrooge's visions take place in his room. We'll get into those next year, but that means for this year that there's no hand on Scrooge's heart in order to uplift him for a journey. Scrooge's reaction seems to be denial. That's kind of what he was doing with Marley, too: refusing to look at him and just generally wishing the whole thing would be over. Robert Zemeckis' Christmas Carol skips straight from Scrooge's hiding in bed after Marley's visit to one o'clock. Scrooge is awake and very frightened, but there's no telling if he got any sleep before that or has just been awake the whole time. If he's been awake though, I doubt he's been fretting over the passage of time. He is clearly super freaked out. As soon as the local church bell chimes one, Scrooge's bed curtains are pulled aside by themselves and a strong, focused light (like a miniature spotlight) turns on. It's pointing straight up at first, but then moves around the room to shine briefly in Scrooge's face before becoming a vertical shaft of light again. The Spirit has been floating near the floor and out of Scrooge's line of sight from his place in the bed. As it raises up, the shaft of light becomes less intense and settles into the flickering flame that makes up the Spirit's head. The Spirit carries the cap and holly branch (at first, anyway; it'll lose the holly branch pretty quick). And it's a small-sized ghost. It kind of does the old-young thing, but in a different way from Dickens. Instead of human features, it's simply a flame with a face. And its body even suggests a candlestick. Zemeckis has Jim Carrey playing the Spirit, which isn't a choice I like, but I do see where they're going with it. If the Spirit is the ghost of Scrooge's Christmases Past, then why not make it look like Scrooge? The problem is that I keep imagining Jim Carrey against a green screen, bobbing and jerking his head around to resemble the flickering of a candle flame. And that yanks me right out of the story. I had the same reactions to seeing Colin Firth and Gary Oldman too accurately represented in their CG characters. Pretty much all my feelings about this version of the Spirit are like that. Every choice is intentional and the goal is always to represent Dickens, but the overall effect is creepy and off-putting (only not just in the intended way). Because the Spirit is so bizarre, Scrooge continues to be frightened. He does ask the Spirit to put its cap on, but he asks very timidly. And the Spirit is so oppressively bright that I understand why Scrooge musters the courage to make his request. (As the Spirit answers him, I notice that it's got an Irish accent for some reason. That would make some sense if Scrooge was himself Irish, but I don't recall that being revealed as true anywhere else in this version. It's probably just Carrey adding one layer too many onto this performance.) Reprimanded by the Spirit for the question, Scrooge is immediately submissive and apologetic. The Spirit just kind of hovers there, being weird, and Scrooge settles down a little, becoming less frightened and more interested in the apparition. "O Come, All Ye Faithful" plays sweetly in the soundtrack as the Spirit reveals what it is. "Rise," it says, "and walk with me." The line is straight out of Dickens, but something about the way that the Spirit grabs Scrooge's hand and gently pulls him out of bed reminds me of the stories where Jesus Christ offered disabled people the chance to "rise and walk." In other words, the Spirit is already a symbol of healing. Sticking with the religious theme, the song swells and becomes "Ave Maria" as the Spirit pulls Scrooge towards the window. As they walk, the Spirit is able to change the direction of the flame on its head so that the spotlight points directly in front of him. So that's how it was shining in Scrooge's face earlier. Scrooge's fear gets the better of him and he grabs his bed curtain to keep from being ushered outside. He explains that he's a mortal and liable to fall. 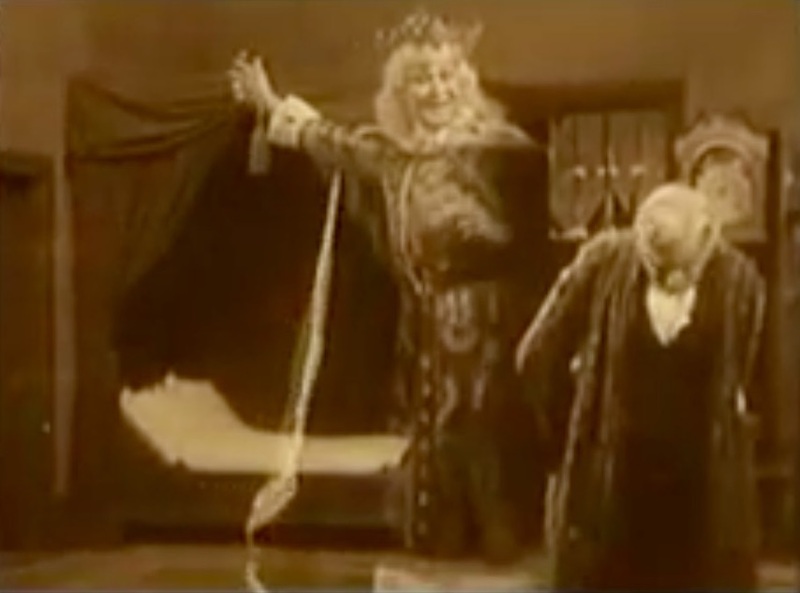 The Spirit touches Scrooge on the heart (leaving its cap floating in midair to do it) and Scrooge looks rapturous as light enters his body and his feet leave the floor. But his ecstasy turns to nervousness when the Spirit shoots them through the room, out the window, and into snowy countryside. In Mickey's Christmas Carol, Scrooge seemed like a believer when he was talking to Marley, but his tone quickly changes once Marley's gone. He searches his room, and finding nothing, he grumbles, "Spirits." That doesn't necessarily mean that he no longer believes in Marley's ghost, but maybe he thinks that Marley was wrong about the other visitors. At any rate, he goes to bed with a final, "Humbug!" He does fall asleep and we get a nice POV shot of something bouncing into the room and landing on Scrooge's nightstand. It's Jiminy Cricket, who raps his umbrella on the bells of Scooge's clock. That's all the chiming we'll get, but this Marley never made any predictions about what time the spirits would show up. In fact, Scrooge's clock says that it's not quite ten minutes after midnight. So no waiting around 'til one this time. Jiminy makes an okay Spirit of Christmas Past. He's tiny (something that Scrooge comments on), but his real advantage is his personality and the role he's known for in Pinocchio. It's in character for him to lecture about morality, which will be a major part of his job in the coming scenes as he points out the lessons that Scrooge should have learned in his past. 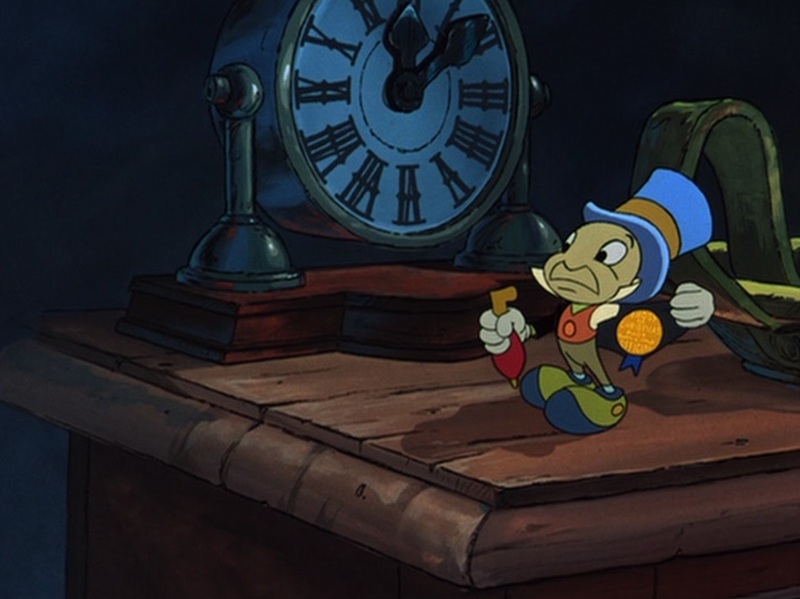 Unlike some of the other characters in this adaptation, Jiminy's look isn't modified to represent Dickens' version. There's not so much as a holly branch. In fact, the only modification to Jiminy's traditional look is that his medal now says "Ghost of Christmas Past - Official" instead of "Official Conscience." Scrooge and the Spirit's conversation is almost entirely changed from Dickens. They briefly debate the importance of kindness before Jiminy declares that Scrooge didn't always undervalue the trait. As Scrooge tries to ignore him and go back to sleep, the Spirit hops over to the window and opens it. The snowy breeze gets Scrooge out of bed as the Spirit announces that they're going to visit Scrooge's past. Scrooge worries that he'll fall, but the Spirit hops in his hand and tells him to "just hold on." Then he opens his umbrella and flies out the window, dragging Scrooge behind him like Mjolnir pulling Thor. Well, maybe not so gracefully as that. There's no touching Scrooge's heart and all together it appears that Scrooge has backslid in this scene. He seemed willing to change with Marley, but he doesn't respect this little Spirit. He's going to need some more convincing. Since Rankin-Bass' The Stingiest Man in Town spent so much time on Marley, it keeps this introductory scene incredibly short. We'll have to get to know the Spirit of Christmas Past as we go. Scrooge doesn't even get a chance to go to sleep. He's still quivering in his bed when the Spirit draws back the curtain and introduces himself. And he's decidedly a man. And an old one. If you're not going to go all out and do the young-old, genderless representation, I understand the impulse to make the ghost old. Scrooge himself is an old man and this spirit represents all of his previous Christmases, so it makes sense that it's as old as he is. Dickens' adding a youthful quality is just a metaphor for how fresh our memories are. We remember even childhood things as if they were "just yesterday." If you've got to pick either young or old though, I think old is the way to go. Incidentally, it's just this year that I paid any attention to the Spirit's explanation (which does come up in this abbreviated version) that it specifically represents Scrooge's past and not all Christmases past in general. I used to think the Spirit must have been 1,980-something years old, but really it's only going to be in its 70s or however old Scrooge is. What I don't accept as much is the decision to make the Spirit male. If you're not going to go genderless, then why not add a woman to the already very male-heavy cast of characters? The Spirit is small like in Dickens, but not supernaturally so. He just looks like a very short person. And he does carry the holly and the cap and he has the bright light shining from his head. This Scrooge is still terrified, so he doesn't dare ask the Spirit to put the cap on. In fact, he doesn't talk to the Spirit at all except to ask if he represents "long past." The Spirit doesn't touch Scrooge's heart either. He simply commands Scrooge to take the Spirit's hand and then flies them both out of the window. As we talked about last year with Scrooge's question about "how" to change, I think his heart has already been touched. He doesn't know what he needs to do, but the interest in changing is already there at this point. As the window opens, Tom Bosley's Humbug character has the chance to come back in, since he was trapped outside during the Marley scene. He watches Scrooge and Spirit go, but stays behind. I don't remember if he witnesses the past with Scrooge, so maybe he catches up later. Richard Williams' animated version had Scrooge hurry off to bed after his encounter with Marley and we find out in this scene that he did go to sleep. He's awakened by the chime of one though, so there's no sitting up and fretting for the last hour. I'm curious to see if any of the theatrical versions include that and how they might handle it, but I expect that most will just cut straight to the Spirit's showing up. Michael Redgrave's narration comes back in rather unnecessarily, since he's just describing things we can see onscreen, like the room's filling with light or a ghostly hand drawing back Scrooge's bed curtain. Once Scrooge and the Spirit speak though, Redgrave backs off. Scrooge is very polite to it. He calls it "sir" (that could be his own bias talking as much as any real understanding of the ghost's gender) and he doesn't complain about the light or ask the Spirit to put on its cap. Scrooge is so polite that when the Spirit says that its there for Scrooge's welfare, there's not even a mention of unbroken rest. Scrooge doesn't even think it, as far as we know. If he does, the Spirit doesn't correct him, but I think that line was left out on purpose. Scrooge's attitude seems to be very complacent and it has been since the end of Marley's visit. It looks like Marley did the heavy lifting on this transformation. Scrooge already seems willing to learn. That might also explain why this Spirit never has to touch Scrooge's heart. It simply says, "Rise, and walk with me," and then whisks Scrooge out of the window. Scrooge doesn't express fear of falling and doesn't appear to need any extra upholding by the Spirit. 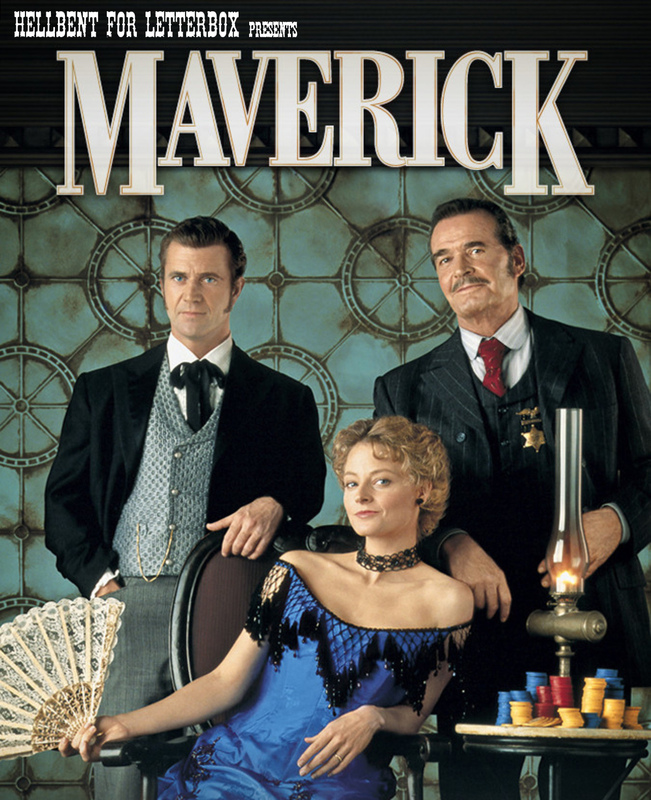 It's cold out there, but Pax and I stayed warm talking about one of our favorite Westerns, 1994's Maverick with Mel Gibson, Jodie Foster, and James Garner. And in a special "Whatchoo Been Westernin'?" segment, we discussed some of the episodes of the Maverick TV show that we watched, too. The Teen Titans version of A Christmas Carol isn't an adaptation, but just an adventure inspired by Dickens' story. Once Robin noticed the similarities between Dickens' characters and the people involved with the Titans' current case, he had the idea of using Christmas Carol tactics to try to redeem Scrounge. So late on Christmas Eve night, when Scrounge is finally alone in his junkyard, Kid Flash shows up and pretends to be the Ghost of Christmas Past. It's never spelled out in the story, but I assume that he's vibrating his molecules at super speed in order to pass through that wall. Unfortunately, his costume is a rush job and looks more like the Ghost of Christmas Yet to Come. Accurately representing the story isn't really the kids' point. They're just using its general approach. Alex Burrows and Micah Farritor's severely abridged version of the story cuts this year's scene down to five panels. In the first, Scrooge is sleeping and a clock chimes one. In panel two, Scrooge wakes up. 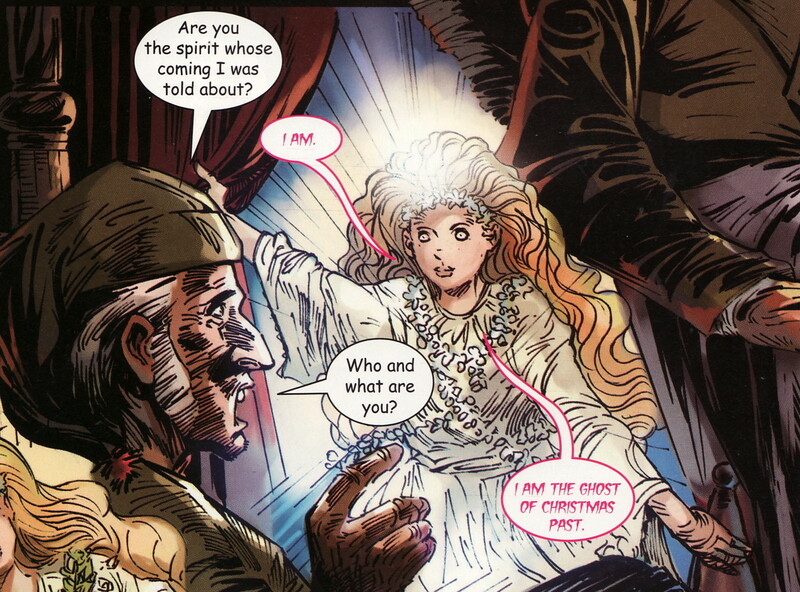 And in panel three, the Spirit appears and Scrooge asks who it is. Panel four is the one above. The Spirit is relatively androgynous; perhaps leaning towards masculine. And it's neither young nor old, but middle-aged. I'm not crazy about that, but I do like the choice to give the Spirit flames for hair. That suggests the flickering nature of the ghost and also provides a source for the light emanating from its head. The holly branch is replaced by a garland that the Spirit wears as a necklace. The cap is there, but Scrooge calls no attention to it and it serves no purpose other than to be faithful to Dickens. 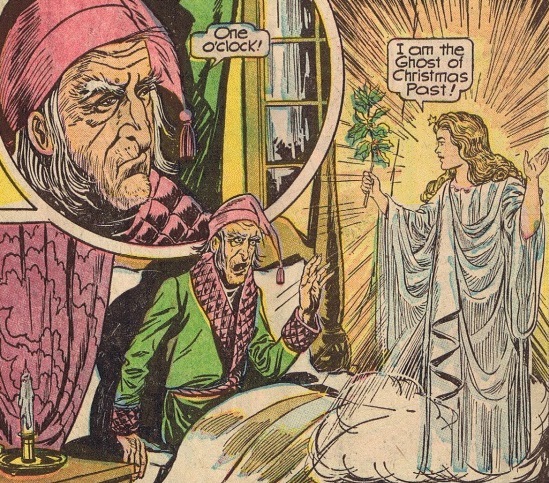 In the final panel, Scrooge asks the Spirit if it's the ghost of "long past." It says, "No, your past" and orders Scrooge to take its hand. Their hands touch in an inset panel and the following panel smash-cuts to the next scene, outdoors. That means that the Spirit never touches Scrooge's heart, but I think Scrooge is going to be okay anyway. He doesn't have much to say, but his eyes are wide and submissive the whole time. He turned humble halfway through Marley's visit and still is. Earlier in the story, this Scrooge's defining characteristic seemed to be arrogance, but his confidence has been shaken by the ghosts and I'm betting he's going to be pretty easy to change. We'll see though. Scott McCullar and Naresh Kumar skip the build-up to the Spirit's appearance and just have Scrooge wake up at the stroke of one. Frankly, that's fine with me. I don't think that the weird passage of time adds to the story and I prefer versions where everything is happening in one night anyway. Kumar draws the Spirit as feminine and vaguely young. Maybe in her twenties? She does carry holly and a cap, but they both appear and disappear from panel to panel. Maybe that's intentional in lieu of a flickering affect. I doubt it - Kumar's art is sloppy in general - but Mike Collins' version did the same thing so I'll cut Kumar some slack, too. Scrooge's reaction to the Spirit is hard to get a handle on. Kumar has a tough time maintaining consistency in facial expressions (or even in just the way he draws eyes), which has created a malevolent, sociopathic version of Scrooge who may be hallucinating all of these ghosts. He's positively horrifying when he asks the Spirit to cover her light with her cap, but thoughtfully complacent when apologizing after she takes offense. He's so all over the place that - like in the Marley scene - the general impression is that he's struggling internally with how to deal with all this. There's no sense that he's actually interacting with real beings. Which makes the Spirit's hand on Scrooge's heart all the more fascinating. This is my favorite depiction of that so far. 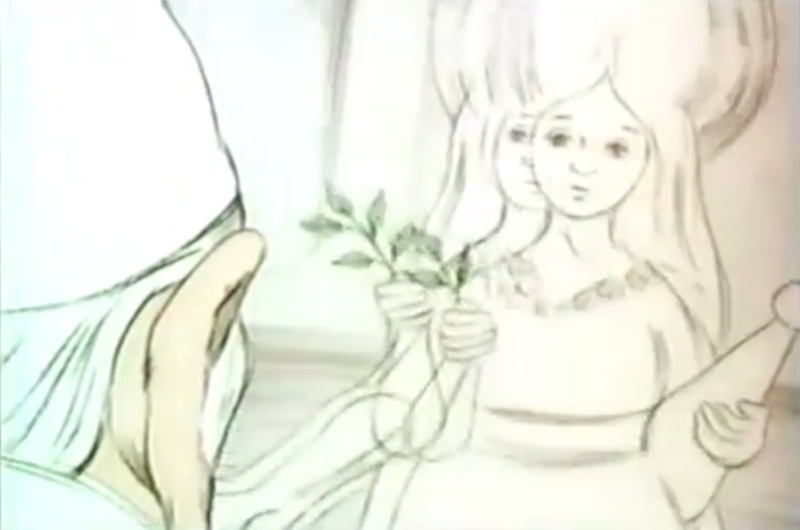 Other versions have only implied or outright changed it, but Kumar has the Spirit's hand firmly on Scrooge's chest with bright light passing from her to him. If I haven't stated it outright yet, I will now that this is a big deal. I believe that Dickens' intention is to show the power that memories have to shape our character. Specifically, that dwelling on positive memories (like of Christmas) can lift our spirits and make us better people. The Spirit's putting its hand on Scrooge's heart is a metaphor for that, but as a thing that literally happens in the story, it also means that Scrooge's transformation isn't entirely his own choice. There's a direct, supernatural influence over his heart that at the very least makes him more receptive to what the Spirit's about to show him. Reading this version as all being in Scrooge's head gives him back the power to change. I still really like this as an alternative reading. The weakness with it though is that there's no obvious reason for Scrooge start struggling with this. I can imagine that it's just something that's been building for a while and is now bubbling over, but that's not satisfying. Maybe there is a supernatural force at work - and maybe it's even Marley's ghost - but it could be triggering this war in Scrooge's mind rather than literally visiting him. 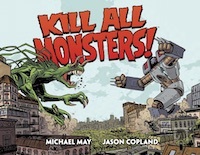 Sean Michael Wilson and Mike Collins' adaptation again makes great use out of its longer page count. There are three entire pages dedicated just to chiming clocks and Scrooge's nervous build-up before the Spirit's appearance. It plays out just like it did in Dickens, with Scrooge's falling asleep and then being awakened by the midnight chimes so that he can count down the final hour. Collins bravely takes up the challenge of faithfully depicting the Spirit. It's an accurate representation from the ghost's diminutive stature to its youthful, androgynous face and long, white hair. 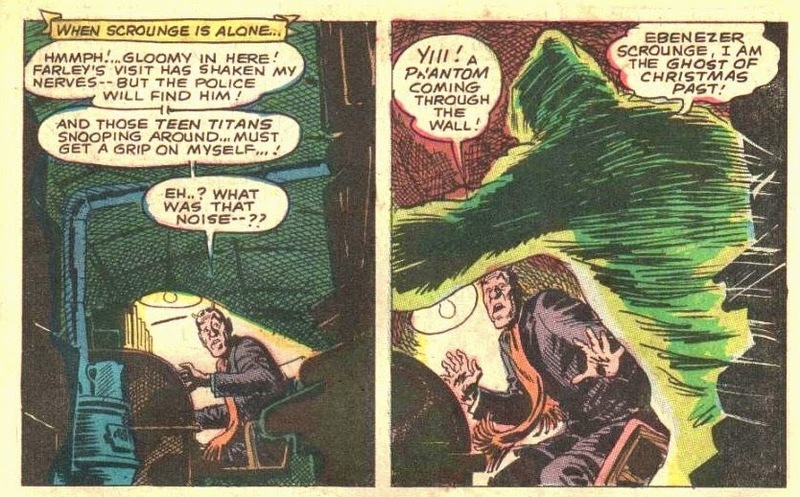 Collins even goes for the flickering effect by giving the Spirit extra limbs in some panels, but not in others. Sometimes it's more legs; sometimes more arms. I wish that the holly branch was bigger, but oh well. And it's interesting that it and the cap disappear and reappear through the rest of the Spirit's visit. They're as ethereal as the Spirit itself. Scrooge's reaction to the Spirit is as Dickens wrote it, but this adaptation calls out something that I missed earlier. In Dickens, Scrooge's observation about "a night of unbroken rest" being best for his welfare is an unspoken thought. I'm so used to its being spoken aloud in movie versions that I read it that way in the text, but Dickens specifically wrote that "the Spirit must have heard him thinking." Wilson and Collins called my attention to it by putting the "unbroken rest" line in a thought balloon. That also helps with what I noticed in the Marvel adaptation, where the "unbroken rest" line is omitted entirely. It was a risky approach for Marvel to just take it out and have the Spirit respond to it anyway, but I'm happy that now it at least looks like it was down on purpose. The thing I don't like about this version of the scene is what it does with the Spirit's touch. Instead of asking Scrooge to bear but a touch of the Spirit's hand on Scrooge's heart, the Spirit pulls Scrooge's hand to its own heart. I guess it still works - that some of the Spirit's own compassion may pass into Scrooge this way - but it's an unnecessary change and I much prefer that the Spirit literally touch Scrooge's heart. 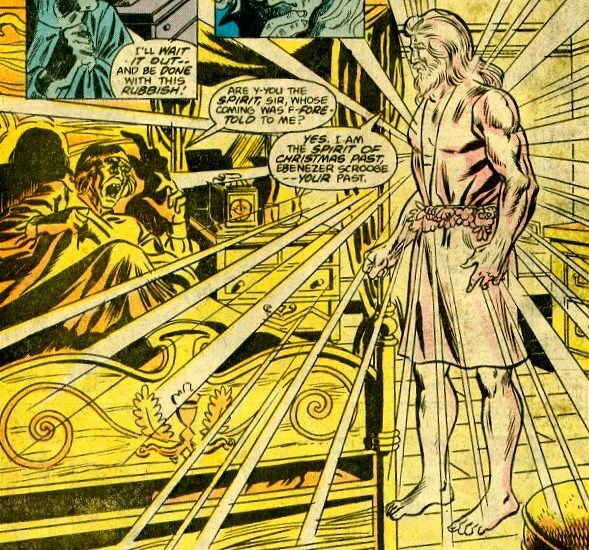 The Marvel adaptation also spends several panels faithfully having Scrooge wake up and fret over the weird passage of time. It does some different things with the Spirit, though. It does away with both holly branch and extinguishing cap, but the biggest change is the choice to make him decidedly masculine (including a beard) and not at all childlike. He's not an old man by any means, but he's essentially a younger version of the Spirit of Christmas Present. He does have the bright glow (not from the top of his head, but I like the dazzling aura effect as it's drawn). What's weird is that Scrooge still makes the comment about wanting the Spirit to put his cap on, even though there's no cap. I'd tally that up with the other evidence in this adaptation that Scrooge is mad, but the Spirit also refers to the nonexistent cap as if it's there. I haven't been able to come up with an in-story explanation that makes any sense, so no Marvel No-Prize for me. There's also a lettering flub where the Spirit mentions Scrooge's welfare, but Scrooge's response is omitted. So when the Spirit says, "Your reclamation, then," he's not replying to anything verbal. Maybe he's reading Scrooge's thoughts, but we aren't privy to them as readers. Then there's one other oddity around the Spirit's touch. Instead of putting his hand on Scrooge's heart, he simply holds his hand out, palm up. And he says, "Bear but a touch of my hand... here." Not "here" as in, "On your heart." But as in, "Here's my hand for you to touch." I don't know why Doug Moench changed the line, but it does something interesting in conjunction with the art. The way the hand intersects with Scrooge's cap, it's possible to read the panel as the Spirit's touching Scrooge's head. That's very interesting to me in a comic where I've been questioning Scrooge's sanity for a while. Instead of Scrooge's heart needing healing, perhaps it's his mind. That's obviously not the intended reading, but it fits with the other things I've been noticing and forcing onto this version. Finishing out the scene, I like how it holds the end of the Spirit's sentence ("and you shall be upheld in more than this!") until the following panel as he's dragging Scrooge out the window and into the air. It's quite dramatic. Faithful to Dickens, Classics Illustrated does take a few panels to have Scrooge wake up, experience the sped-up progression of time, and fret about it. It abandons the old-young Spirit though and goes for a youthful specter with long, blonde hair. 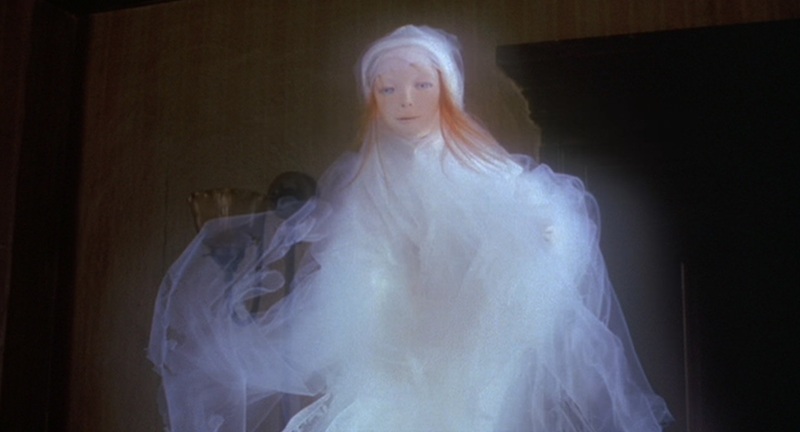 Something I didn't mention yesterday was Dickens' refusal to assign a gender to this ghost. He always refers to it as "it." Visual depictions are going to have to decide what to do about that and Classics Illustrated cleverly chooses an androgynous look. 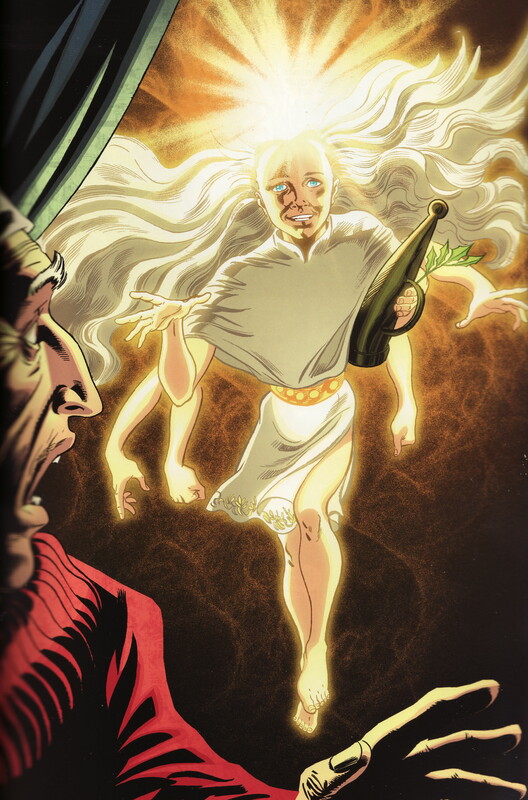 The Spirit has the holly branch in this one and that bright light effect is part of its appearance in every panel, but there's no extinguisher cap. Which is probably good, since this version of Scrooge is one of the meanest and least sympathetic. I wouldn't be surprised to see him extinguish the Spirit's light if he had the opportunity. So the story doesn't give him one. It also abbreviates Scrooge's conversation with the ghost. Scrooge stammers his initial question about the Spirit's purpose (the old man is clearly scared; there's just not any evidence of change yet) and the Spirit answers that it's there for Scrooge's "welfare and reclamation." That robs Scrooge of his humorous line from the book about a night of unbroken rest. But the Marley scene also removed Scrooge's sense of humor. This Scrooge is all business. It does take a panel to touch Scrooge's heart though. Or rather, to point at Scrooge's heart. We never see the actual touch. The implication is that it happened though, since Scrooge and the Spirit are outside in the next panel. We'll just have to wait to see if the touch had any effect in "upholding" the old man. When Scrooge awoke, it was so dark, that looking out of bed, he could barely distinguish the transparent window from the opaque walls of his chamber. He was endeavoring to pierce the darkness with his ferret eyes, when the chimes of a neighboring church struck the four quarters. So he listened for the hour. As we noticed last year, Dickens' version had Marley announce that the ghosts would visit one per night over three nights. I assumed that the first visit would start that very night on Christmas Eve, but Dickens makes it clear that that's not the case. Scrooge went to bed at 2:00 am on Christmas morning, so the clock rushes all the way through Christmas Day and we're now hearing it chime midnight as December 25th becomes the 26th. Of course, most adaptations will ignore this and have everything happen on one night, but I'll point out the ones that stay faithful. I think I remember that some of them do. He touched the spring of his repeater, to correct this most preposterous clock. It's rapid little pulse beat twelve; and stopped. A repeater was a kind of clock that would chime the hours (and even minutes, using a different tone) when you pressed a button. It was a way to figure out what time it was in the dark without having to light a candle. I doubt many (if any) adaptations will include this detail, but maybe. The idea being an alarming one, he scrambled out of bed, and groped his way to the window. He was obliged to rub the frost off with the sleeve of his dressing-gown before he could see anything; and he could see very little then. All he could make out was, that it was still very foggy and extremely cold, and that there was no noise of people running to and fro, and making a great stir, as there unquestionably would have been if night had beaten off bright day, and taken possession of the world. This was a great relief, because "three days after sight of this First of Exchange pay to Mr. Ebenezer Scrooge or his order" and so forth, would have become a mere United States' security if there were no days to count by. A couple of things are going on at the end of that paragraph. Basically, Scrooge is worried that he's going to run out of time to cash in certain IOUs. A "United States security" was a derogatory term that referred to the poor credit that the US had with other countries at the time. So Scrooge is concerned that some of his accounts will become worthless if time is speeding past deadlines. Scrooge went to bed again, and thought, and thought, and thought it over and over and over, and could make nothing of it. The more he thought, the more perplexed he was; and the more he endeavored not to think, the more he thought. Marley's Ghost bothered him exceedingly. Every time he resolved within himself, after mature inquiry, that it was all a dream, his mind flew back again, like a strong spring released, to its first position, and presented the same problem to be worked all through, "Was it a dream or not?" Scrooge lay in this state until the chimes had gone three quarters more, when he remembered, on a sudden, that the Ghost had warned him of a visitation when the bell tolled one. He resolved to lie awake until the hour was past; and, considering that he could no more go to sleep than go to Heaven, this was perhaps the wisest resolution in his power. I doubt many adaptations will spend time on Scrooge's wakeful fretting. If memory serves, they'll either have him go right to sleep after Marley to be awakened by the First Spirit, or they the First Spirit simply shows up right away. We'll keep track, though. I'm having trouble following the timeline at this point. The clock sped ahead to midnight, then Scrooge fretted for 45 minutes and decided to just wait out the last 15 minutes until 1:00 am. But within those last 15 minutes, the clock chimes three 15-minute periods. Dickens seems to be messing with readers to make them as uncertain about the passage of time as Scrooge is. I love that image, that Dickens, as storyteller, is right here with us as we read. It makes him immortal, which, of course, he is. It was a strange figure - like a child: yet not so like a child as like an old man, viewed through some supernatural medium, which gave him the appearance of having receded from the view, and being diminished to a child's proportions. Its hair, which hung about its neck and down its back, was white as with age; and yet the face had not a wrinkle in it, and the tenderest bloom was on the skin. The arms were very long and muscular; the hands the same, as if its hold were of uncommon strength. Its legs and feet, most delicately formed, were, like those upper members, bare. It wore a tunic of the purest white; and round its waist was bound a lustrous belt, the sheen of which was beautiful. It held a branch of fresh green holly in its hand; and, in singular contradiction to that wintry emblem, had its dress trimmed with summer flowers. 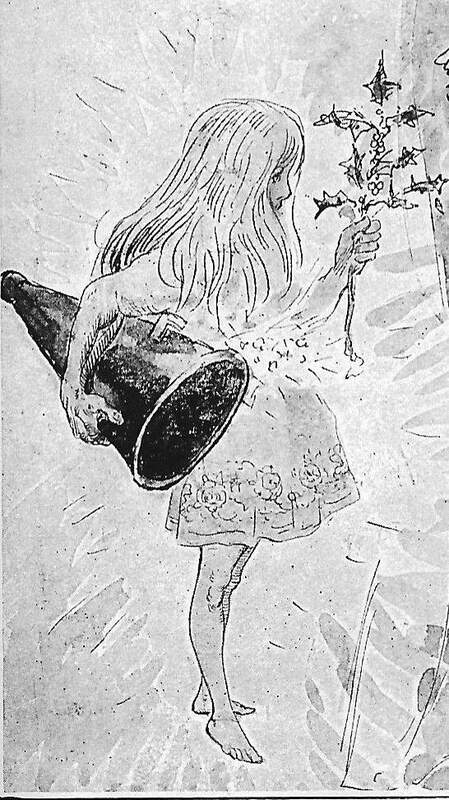 But the strangest thing about it was, that from the crown of its head there sprung a bright clear jet of light, by which all this was visible; and which was doubtless the occasion of its using, in its duller moments, a great extinguisher for a cap, which it now held under its arm. It's easy to see why this Spirit gets the most variation in how it's represented. It has to be simultaneously old and young, while also as flickering and changing in appearance as a flame. Almost impossible to do with live action and even tough for the static images in comics. If anything's going to be able to get close, it'll have to be the animated versions. It'll be fun to see which aspects of the Spirit the different adaptations focus on. And I wonder how those highlighted aspects will relate to Scrooge's reaction to this Spirit and what lessons he learns from it. For example, if the Spirit is depicted as old in a version, what does that say about its message to Scrooge? And how does that change if the Spirit is depicted as young? We won't be able to answer all of those questions this year, but by noting what the various versions are emphasizing in the Spirit, we'll lay groundwork to build more complicated theories on in the next couple of years. Scrooge reverently disclaimed all intention to offend, or any knowledge of having wilfully "bonneted" the Spirit at any period of his life. He then made bold to inquire what business brought him there. I notice that while Scrooge still has some wit about him, he's being very polite to the Spirit. Marley wore him down to the point where he acknowledged that there may be some need for change. But Scrooge isn't ready to commit to making those changes. It sounds hard... and he's prideful. So we'll take note of Scrooge's attitude towards the Ghost in the adaptations. It put out it's strong hand as it spoke, and clasped him gently by the arm. It would have been in vain for Scrooge to plead that the weather and the hour were not adapted to pedestrian purposes; that bed was warm, and the thermometer a long way below freezing; that he was clad but lightly in his slippers, dressing-gown, and nightcap; and that he had a cold upon him at that time. The grasp, though gentle as a woman's hand, was not to be resisted. He rose: but finding that the Spirit made towards the window, clasped its robe in supplication. "I am mortal," Scrooge remonstrated, "and liable to fall." A lovely image and claim to end on. I wonder how many adaptations will include it. The timeline: which adaptations rush through the clock to get to midnight the next day? Scrooge's attitude toward the Spirit. Does the Spirit touch Scrooge's heart?